General Motors reported second quarter 2013 net income attributable to common stockholders of $1.2 billion, or $0.75 per fully diluted share, from revenue of $39.1 billion. The results represent a $300 million decrease in net income compared to Q2 2012, when The General reported a net income of 1.5 billion, or $0.90 per fully diluted share. Revenue was up $1.5 billion, from $37.6 billion in Q2 2012. GM points out that the Q2 2013 results include a net loss from special items that reduced net income by $0.2 billion, or $0.09 per fully diluted share. Net income for Q2 2013 included an increase in tax expense of $0.5 billion, or $0.29 per fully diluted share, compared to the second quarter of 2012. Furthermore, earnings before interest and tax (EBIT) adjusted was $2.3 billion, compared to $2.1 billion in the second quarter of 2012 — an increase of $200 million year-over-year. 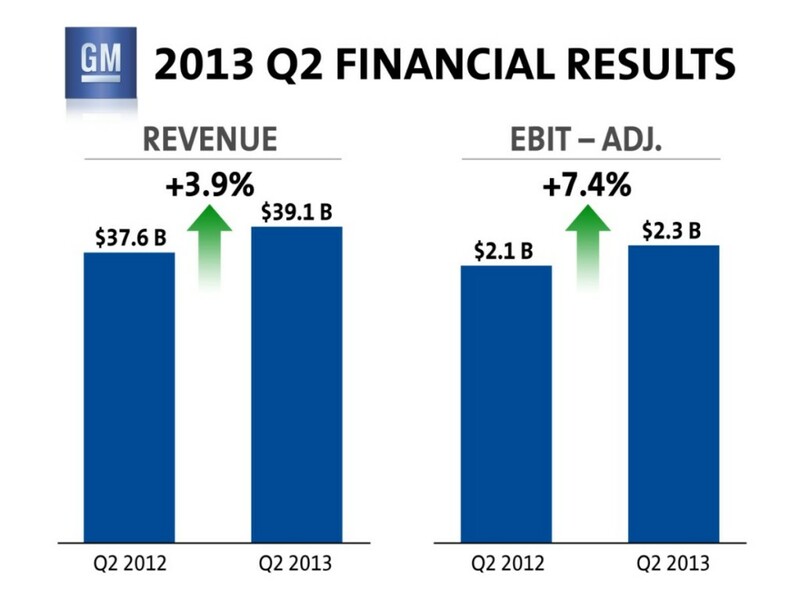 GM North America reported EBIT-adjusted of $2.0 billion, compared with $1.9 billion in the second quarter of 2012. GM Europe reported an EBIT-adjusted of $(0.1) billion, compared with $(0.4) billion in the second quarter of 2012. GM International Operations reported EBIT-adjusted of $0.2 billion, compared with $0.6 billion in the second quarter of 2012. GM South America reported EBIT-adjusted of $0.1 billion, compared with EBIT-adjusted of $0.0 billion in the second quarter of 2012. GM Financial earnings before tax was $0.3 billion for the quarter, compared to $0.2 billion in the second quarter of 2012. For the quarter, automotive cash flow from operating activities was $4.5 billion and automotive free cash flow adjusted was $2.6 billion. GM ended the quarter with very strong total automotive liquidity of $34.8 billion. Automotive cash and marketable securities was $24.2 billion compared with $24.3 billion for the first quarter of 2013. Previous story Opinion: Does General Motors Really Need To Co-Develop Vehicles With PSA Peugeot Citroën? Thanks for providing this. With all the adjustments (positive and negative), net income is not usually the most informative number, so it’s good to see cash flow improved significantly (though even there, I’d have to look at how it was “adjusted” before I popped the champagne) but overall, this is good. People on other sites are killing GM for this once again! Only in America will people complain about a company that turns a profit for the quarter, they will spin anything to make it look bad! Compare it to the quarter before, the year before, or year before that, or the month to month numbers they will do the same! But what they leave out is what happen in that quarter or that month to make the numbers look so bad! Numbers can be spun and made to look good or bad! But when you leave things out and don’t tell the whole story it lends to giving people false ideas of how well GM is doing! So GM profits are up, stock price is up, sales for the year are up! Now is everything perfect no! But its not falling skies!